THEY were once great reservoirs that quenched the thirst of millions, but many of California’s great lakes have been turned to dust. Disturbing aerial footage captured by California’s Department of Water Resources team shows the devastating effect the record-breaking four-year drought has had on the ravaged state. 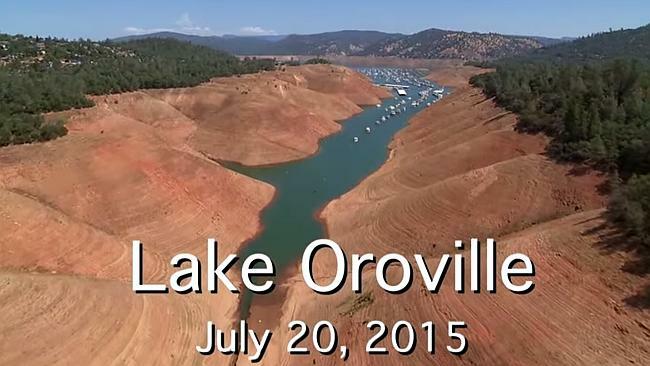 The footage, taken at Northern California’s Folsom Lake, Lake Oroville and Shasta reservoirs this week, details the parched landscape that has been gradually dwindling as California struggles to curb an ever-increasing demand for water. Lake Oroville, which is used to fill taps in Los Angeles and San Francisco, is nearing a record low, while last month at a meeting of the State Water Resources Board, officials warned Folsom Lake could be 96 per cent empty by January 2016. “It’s just bad. It’s just bad,” Sacramento Region Water Forum executive director Tom Gohring said. All hopes to refill the reservoirs depend on an apparent El Niño weather pattern, which climatologists believe will move into the area by winter. It is expected to bring with it tropical air that could potentially restore water flow to communities that no longer have running tap water. But it’s anyone’s guess if the rain will ease the driest conditions since the Middle Ages. “We don’t have a lot of confidence in these models,” University of California Irvine hydrologist, engineer and climatologist Amir AghaKouchak said of predictive weather patterns. “Last year we also had an El Niño prediction. That didn’t happen. one day than all of January combined — it’s not enough to bring relief to the incredible deficit seen by the drought. The National Oceanic and Atmospheric Administration estimates at least 300 to 400 inches of rain would be needed fall in order to raise levels out of the red.